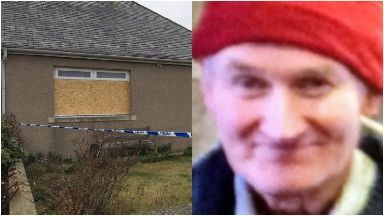 Brian McKandie was found dead in his cottage. Steven Sidebottom was described in court as obliging, always willing to help. He's the father of a young daughter. He'd never been in trouble with the police before. But the 25-year-old part-time DJ wasn't earning much money. He lived and worked on his father's farm near Rothienorman. The court was told he made around £200 a month, most of which went on child maintenance. In the days before the murder he texted a friend saying he needed £2000 in cash. He was under pressure to help pay a VAT bill at a local hotel. His girlfriend's birthday was also approaching fast. He knew local mechanic Brian McKandie. He'd been a frequent visitor to his house just a few miles away where the handyman carried out car and household repairs. He'd heard the stories about the 67-year-old always having "money in his shoebox". It later transpired there was over £200,000 in notes in the house in a variety of boxes and sweetie tins. Brian McKandie was a very wealthy man. The court heard phone evidence put Steven Sidebottom in the area at the time of the killing. His account of events just didn't add up. There was a significant gap of two hours when he was out of touch. And he arrived at his girlfriend's flat in Aberdeen late, with a wad of cash wrapped in elastic bands. He later lavished her with birthday gifts and later, even a car. He'd also been around to the Vale Hotel in Fyvie to pay the money he was due. The following day Brian McKandie's battered body was found in the living room of his cottage. He'd been beaten around the head at least 15 times. Police later said they'd never seen more violent injuries. Initially they didn't think it was a murder. But a week later they announced major investigation. Steven Sidebottom was worried. He knew his fingerprints would be at the scene. After all he was a frequent visitor to the house. He'd even been spotted there the night before. He phoned friends trying to cover his tracks. The trial was told there was no DNA to put him there and not one print. But prosecutor Iain McSporran told the jury absence of evidence did not mean evidence of absence. 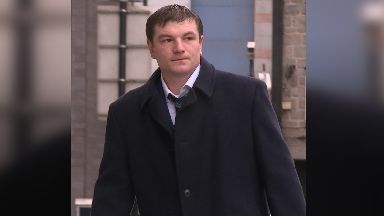 Defence agent Ian Duguid argued there was no proof there had ever been a robbery at all and said it was improbable a man with no previous convictions would kill a friend to pay a VAT bill. But the court also heard Sidebottom had earlier threatened to break the legs of a man who owed him money. Mr McSporran said all of the circumstantial evidence when considered together pointed to the man responsible. The jurors believed him and Steven Sidebottom is facing a lengthy period behind bars. Alastair Forsyth, a local councillor, describes Sidebottom as a Walter Mitty character who you could never know was telling you fact or fiction. He says the village, population just 500, will take a long time to recover from the horror and the shock visited on it by the violent attack on a quiet pensioner with a fortune hidden in his cupboards. It will be a long time, if ever, before Steven Sidebottom sees Rothienorman again.